Why do you want out of the Philippines? We are moving back to the USA, why are we fleeing the Philippines? Ever since my misinterpreted article a couple of months ago which made some readers think that we were moving back to the USA, people have been asking me what we are running away from. Why do we want to leave the Philippines? At the time I wrote that article, I really had no intention of leaving the Philippines, we had (again) decided to stay in the Philippines. There is nothing in or about the Philippines that is pushing us away. We, in fact, had a very tough decision about what our future would be. Did we want to stay in the Philippines? Did we want to move back to the USA? Did we want to choose another expat destination? Choosing another expat destination has been something I have considered for years, but always thought of it as something off in the future. Moving back to the USA is something I never even considered until 2015. 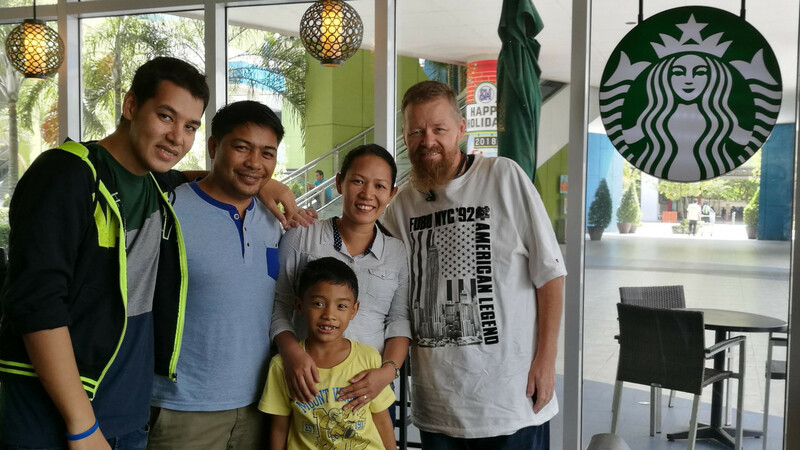 We have greatly enjoyed our life in the Philippines. The first few years took some significant adjustments, but we made it through, and have had some great times here. But, nothing in life is permanent. As people, we are always looking for new experiences, and changes to improve our lives. We feel it is a good time to make some life changes. Really, what it comes down to is that we are excited for a change of scenery. It is time for that in our lives. At this point, I have lived in Davao City for longer than in any other place in my life. I love Davao, and I love the Philippines. So does Feyma. But, we are just ready for a change. For the past 3 years, we have considered making this move so many times, but we always decided not to do it. Even so, we would continually revisit the topic again. The very fact that we kept considering it over and over shows that we were serious about it. I am 56 years old, Feyma is 50. We feel like this is a good time to make a change. We desire a change, but also feel that even if we wanted to make the changes in another 10 years or so, we might feel too old to make such a change. At our current ages, we feel that we can go back, reestablish ourselves, get into business things there to make a good living, etc. If we were in our 60’s or older, that might be more difficult. An international move is a major undertaking and in so many ways, we just feel that the time is now. Will we return to the Philippines? Well, you never know, do you? We honestly feel that we have already lived here, and enjoyed it, but are ready to move on, and it is doubtful that we would ever live here again. What about vacation, will we vacation here? Again, unsure, but probably unlikely. Oh, we will probably be back for a visit, but not that regularly. In our young married life, the only place we ever went for vacation was to the Philippines so that Feyma could visit her family. We have always wanted to travel more. Feyma, in particular, ts to go to a number of places in Europe. I also have places I want to go. Our “wish lists” are not anywhere near the same, but we can each explore places that the other wants to visit, no problem. We might discover that we like places that we did not expect to like. But, currently, we are more interested in traveling to new places, and not so much about coming back to visit the Philippines, at least not on a regular basis. Another reason that has prompted us to make this decision, although a more minor part of the decision, is that our two youngest sons, Aaron and Jared, are now living in the USA. Each of them went to Alaska to work this year (and Aaron did last year as well). Aaron has decided to settle in Atlanta, Georgia, and Jared is pursuing a long-term career in Alaska, for now at least. So being located in the USA will keep us close (but not too close) to our kids as they grow into adults. Remember, more articles on this topic until Saturday, so tune in for more info! Sounds like you put a lot of thought into your decision and rightfully so. Good luck Bob. America is VERY different than when you left. I hate to see you go, Bob, but everything you’re saying is understandable and legitimate. Thanks, Max. We are just ready for a change after a long life in the Philippines! But who’s going to be Santa? … Also, people moving to the Philippines are not always running away from their home country. Sometimes people feel simply feel like it’s time for a change or an adventure. Your reasons for the move in the other direction seem to be well reasoned. I’m curious to hear what you will do regarding this site….keep as is, … reduce updates, … turn it over to someone else, ….or simply discontinue. Whatever you decide, I’m sure all the past contributors (like me) and the present ones will support you 100%. Hi Steve – Nice to hear from you! I hope you are doing well. As I recall, you are living in Chicago, is my memory correct? We might meet up some time, as we plan to settle only about 100 miles away from you. We feel we have made the right choice. Have been thinking it over for about 3 years. Once we pulled the trigger, everything felt good to us. On Friday I will have an article about what is likely to happen to LiP, so you will find out soon! Thank you, I do believe we made a good decision. We’ve had a great life. As you say, we are turning the page, an analogy that I had not thought of. I have always loved Montana, very much. We have settled on living in Logansport, Indiana. I have spent a lot of time in Montana (my dad was from there). Been to Yellowstone so many times, but I will certainly be back. LiP will be continuing, and I will explain more about that on Friday.